When I got my review copy of Marisa McClellan's latest book a few weeks back, time seemed to stand still for the moment and I almost immediately read the entire thing cover to cover. I had been looking forward to cracking open this one since I had the pleasure of testing a few of the recipes for it last year, and it truly is a lovely addition to the growing canning book section of my kitchen library. I couldn't help but think as I turned page after page that Marisa is going to be writing new books for years. She has the magic trifecta in her cookery books: timeless recipes, succinct instructions, and simple inspirations. She is passionate about her craft, and eager to share with everyone - which I think is the underlying theme of Preserving by the Pint. Organized by season, this book encourages everyone to make small batches using local and seasonal foods. It tempts us to branch out and try something maybe we haven't considered before, even to source special ingredients that might not be cost efficient if making a more traditionally sized amount. 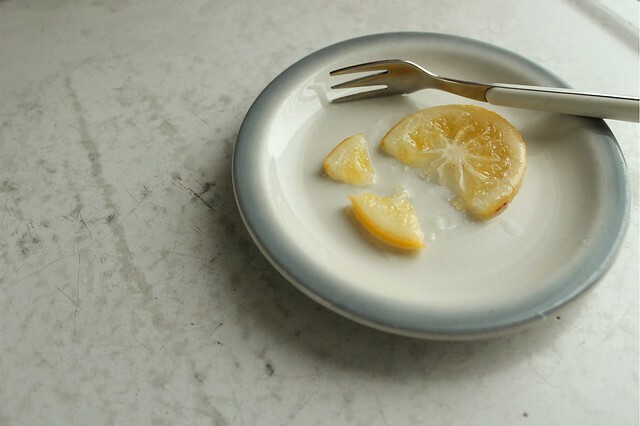 I really loved these candied lemons, they had a nice marmalade texture and trademark Meyer lemon astrengency. I was glad I had a little bit of the syrup leftover which set into a little lemon jelly to enjoy right away on morning toast. I intend to make a pound cake for my birthday in September and crown it with a jar of them, and I should be able to save a jar that long since the 2 jar yield leaves me one to enjoy before then. 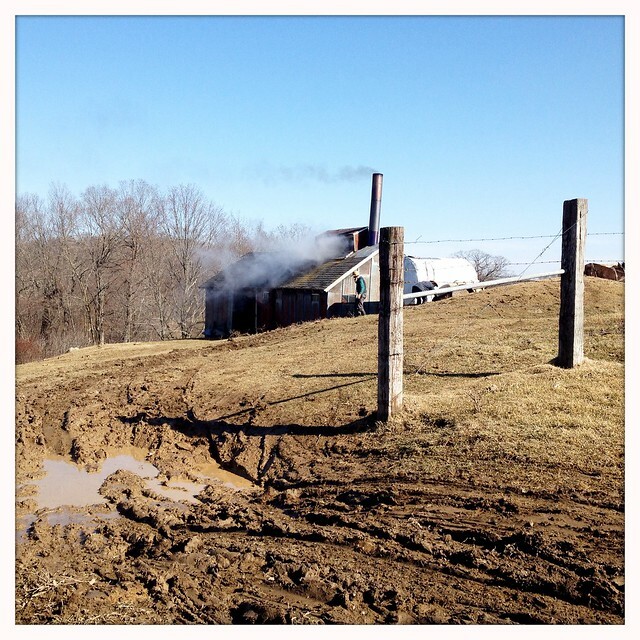 As I stood there breathing in the sauna of maple scented sap, I was dreaming of a recipe Marisa included in the book for Blueberry Maple Jam - thankful for my hoarding of a gallon bagful of blueberries in my freezer from last year, and thankful for a new harvest of syrup to replenish my waning stores. When I got back home, I started the jam right away but got busy. Fortunately, letting the fruit macerate overnight with the syrup and brown sugar is an acceptable practice. My yield was a little less than the 2 half-pints, but I suspect it is because I used frozen fruit. I haven't had blueberry jam in ages - in part because of the amount of berries it requires - and this one was so good. I was actually glad I was a little shy of a second half pint so I had some to enjoy right away. I made this jam with frozen berries and using the metric weights. As I mentioned above, I think I lost a little volume due to the frozen fruit - but this is so good I probably wouldn't have needed to can it! If canning, be sure to use the bottled lemon juice. As Marisa explains, maple syrup is lower in acidity than sugar and the bottled lemon juice ensures a safe acid level. 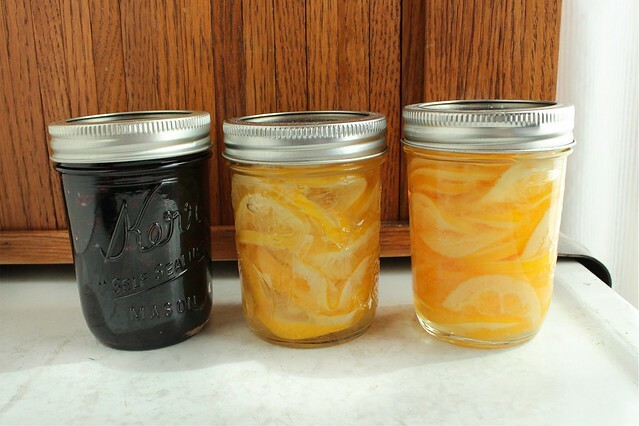 Prepare a boiling water bath and 2 half-pint jars. Place 2 lids in a small sauce pan of water and bring to a gentle simmer. 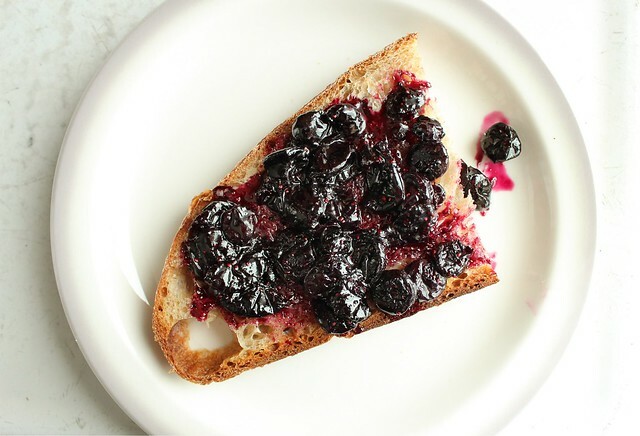 Combine the blueberries, sugar, maple syrup, and lemon juice in a large skillet. (I used this 3-quart one, which was a perfect size.) Stir to help the sugar dissolve and to integrate the maple syrup. Once the mixture has begun to look syrupy, place the skillet over medium-high heat and bring to a boil. 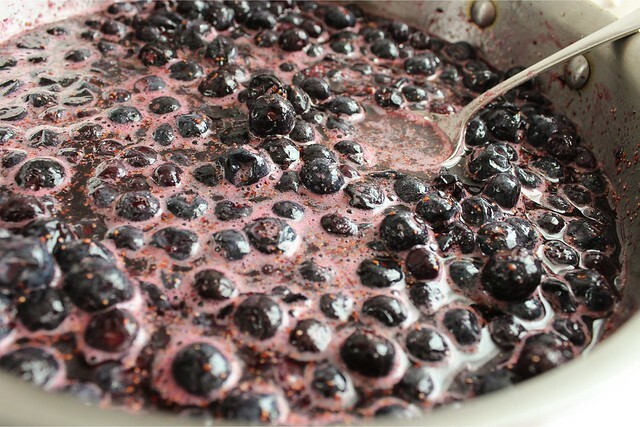 Stirring regularly, bring the fruit to a boil and cook until it bubbles and looks quite thick, 10-12 minutes. 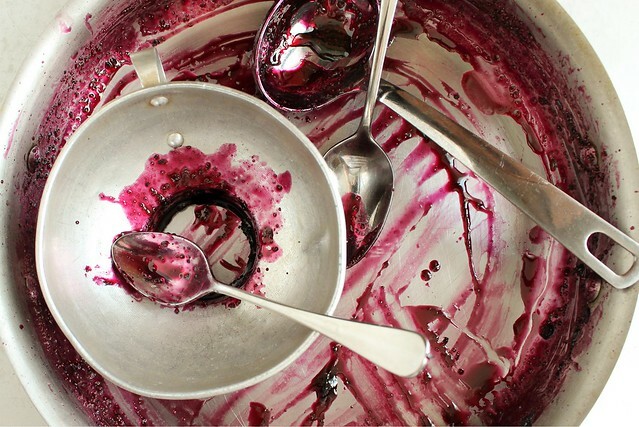 It's done when you pull a spatula through the jam and it doesn't immediately rush in to fill the space you've cleared. When the jam is finished cooking, remove the pot from the heat and pour into the prepared jars. Wipe the rims, apply the lids and rings, and process in a boiling water bath for 10 minutes. I can't say I've ever used my 3 quart saucepan to make jam before, and that is a great tip for small batches in particular. The surface area helps evaporate the liquid faster; I really couldn't believe the small batch was finished cooking in just 10 minutes. Another great thing about this book is that if you make just a few jars of something, you wouldn't necessarily have to can it if you didn't want to. Save yourself a jar, and share another with a neighbor or two and save yourself a hot water bath and the canning time. But I am looking forward to a little patchwork of fully preserved jars on the shelf by the first frost of fall, new preserves from this beautiful book to take me through the winter and help me wait out the time until Marisa's next book. 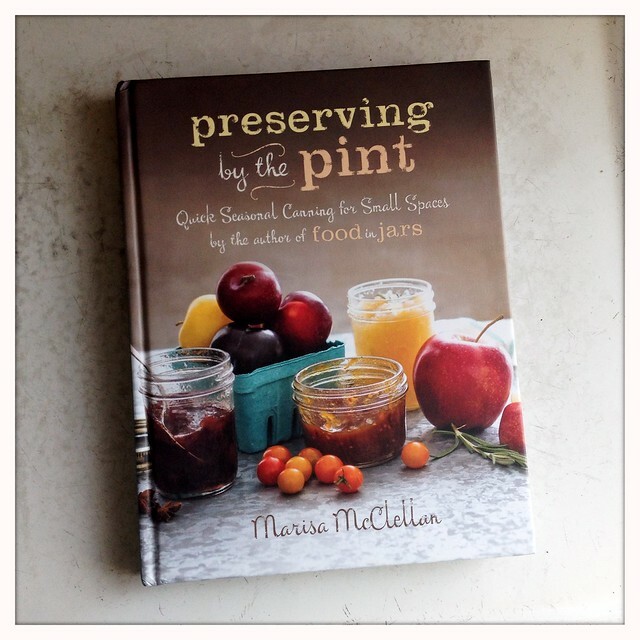 You can catch more glimpses of Preserving by the Pint at The Preserved Life, Well Preserved, Hip Girls Guide to Homemaking (still a couple of days left to enter their giveaway), and of course at Food in Jars where you can also find Marisa's upcoming appearances. DISCLOSURE: I received a copy of this book for review, but as always all of my thoughts and opinions are my own.